These are the opening words of wisdom to “The Tree of Life”, by Terrence Malick, starring Brad Pitt, Jessica Chastain and to a smaller extent, Sean Penn. I went to see it a couple of weeks ago, hooked on some flattering reviews, including a full four-star appraisal by Roger Ebert himself. The first half an hour or so did not look particularly promising as by then some people had walked out already. Indeed, the 30-40 minutes of continuous creation and evolution was heavy-going. The formation of the universe, of our dear planet Earth, of living organisms, of dinosaurs and marine creatures – it was all spectacularly overpowering. It felt like a National Geographic documentary more than a Brad Pitt/Sean Penn blockbuster, which I was secretly hoping it wouldn’t be anyway. We are then immersed in the life of a typical, 1950s American suburban family - the O’Briens. The father (Brad Pitt) is ex-military and evidently took part in the war. He is a plaintive, Bible-bashing patriarch who insists his children address him as ‘Sir’. The mother (Jessica Chastain) is gentle and diplomatic, and she speaks very little, though she always looks as though she has a lot say. For the majority of the film we slowly follow the three young children around the house and neighbourhood, as they develop as individuals and come to gradually lose their rose-tinted view of the world. We learn at the start that one of the children has died (perhaps in the Vietnam War), and we see the mother and father’s anguish as they cope with this tragedy. The highlight of the film is not its stunning cinematography – this is a device primarily used for perspective. It makes the lens through which we see the world that much wider. Malick’s point of view is that of the Hubble Space Telescope, with huge aperture, peering into life’s cosmic depths. Simple words, rendered eternal by the narrative’s slow but effective unfolding. From the point of view of a filmmaker, it is precisely the moment when a character utters such uncomplicated, almost clichéd words, that is the real gamble. Will it work? Will it be derided for being clichéd, or will it be cherished as poetry? In Malick’s case, the gamble pays off. By the time these lines are pronounced, we are so fixated on the life of the O’Briens and have established such rapport with them that we feel almost a part of the family. We discern bits of our own childhood in there, from the mischief in the classroom to hearing your parents’ muffled arguments through half-open windows – these are all simple memories shared by us all. They can cause pain and turmoil when gazed at from a distance and this is what the film is compelling us to do. The only other movie which achieves that very same effect as skilfully is Andrei Tarkovsky’s Mirror. Of course, nothing comes close the Russian masterpiece in terms of pure lyricism and fluidity, but the essence is there, namely a sort of Proustian “a la recherche du temps perdu”. We are periodically carried over to the present where one of their children (Sean Penn), now grown up and an architect, reminisces about his childhood, his parents and his brothers. Something obviously irks him from deep inside. It is a cocktail of guilt and nostalgia, served ice cold in the hourglass of his middle-age. The film itself offers us such a cocktail too and this is where it scores the most points. 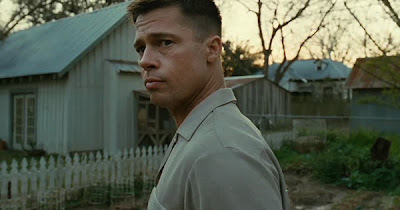 Malick views art as a form of interrogation. First, it triggers an emotion: neurons are pumped up from one place to another. Then the heart picks up the pace. And then we see a bit of ourselves in there, among the many specks that make up the image we are looking at. The brain’s primary forte is association. It connects all those little dots that make up our consciousness, and then just as fast, it erases other dots and connections. Our mind impresses and represses at the same time. But somewhere along the way, the reverse happens, and there erupts within our psyche, the irksome, long-repressed memory of a distant past. This is what Sean Penn’s melancholy hero experiences as he wanders around the convoluted, almost surreal architectural maze of the city he inhabits – a landscape no doubt reflective of the state of mind he finds himself in. How can one possibly reconcile oneself to this repressed memory? The pain of knowing that this precious little bubble of reminiscence is but an apparition of a moment, lost in time and space, never to come back – it is a shock from which we can recover only by reliving it again through art. It’s a mental simulation, an age-old survival mechanism. Is it perhaps the same thing which deters that Troodon from killing the fallen Parasaurolophus by the riverside, in one of the film’s most enigmatic episodes? Mercy against all the odds? Note how right after this curious scene, we see an asteroid slamming into the earth and wiping out the dinosaurs. Is the Troodon divinely punished for defying its nature? Is this an allusion to humankind’s tendency to lose itself in hubris, revolting against the natural world, denying its own essence? At the end of the film, we see all the O’Briens, dead and at peace with each other, on a seemingly endless beach .They are smiling, kissing and hugging each other. They are tenderly stroking each other’s cheeks with their hands. This is Malick’s vision of paradise. United in death, the family is together, happy and free. Likewise, in its finest hour of great pity and selflessness, the Troodon is killed, along with all of its kind. In Tarkovsky’s Mirror, the faceless narrator dies stroking a dead bird which is mysteriously brought back to life at the moment of his death. It seems that for Malick as for Tarkovsky, tenderness is our most noble invention but at the same time, it is what’s killing us softy.